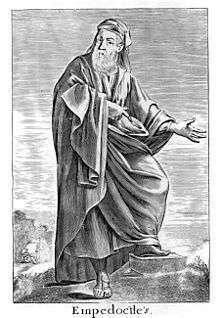 Influenced by the Pythagoreans, Empedocles was a vegetarian who supported the doctrine of reincarnation. He is generally considered the last Greek philosopher to have recorded his ideas in verse. Some of his work survives, more than is the case for any other pre-Socratic philosopher. Empedocles' death was mythologized by ancient writers, and has been the subject of a number of literary treatments. Empedocles was born, c. 490 BC, at Acragas (Agrigentum) in Sicily to a distinguished family. Very little is known about his life. His father Meto seems to have been instrumental in overthrowing the tyrant of Agrigentum, presumably Thrasydaeus in 470 BC. Empedocles continued this tradition by helping to overthrow the succeeding oligarchic government. He is said to have been magnanimous in his support of the poor; severe in persecuting the overbearing conduct of the oligarchs; and he even declined the sovereignty of the city when it was offered to him. The contemporary Life of Empedocles by Xanthus has been lost. Empedocles, like the Ionian philosophers and the atomists, continued the tradition of tragic thought which tried to find the basis of the relationship of the one and many. Each of the various philosophers, following Parmenides, derived from the Eleatics, the conviction that an existence could not pass into non-existence, and vice versa. Yet, each one had his peculiar way of describing this relation of Divine and mortal thought and thus of the relation of the One and the Many. In order to account for change in the world, in accordance with the ontological requirements of the Eleatics, they viewed changes as the result of mixture and separation of unalterable fundamental realities. Empedocles held that the four elements (Water, Air, Earth, and Fire) were those unchangeable fundamental realities, which were themselves transfigured into successive worlds by the powers of Love and Strife (Heraclitus had explicated the Logos or the "unity of opposites"). Like Pythagoras, Empedocles believed in the transmigration of the soul, that souls can be reincarnated between humans, animals and even plants. For Empedocles, all living things were on the same spiritual plane; plants and animals are links in a chain where humans are a link too. Empedocles was a vegetarian and advocated vegetarianism, since the bodies of animals are the dwelling places of punished souls. Wise people, who have learned the secret of life, are next to the divine, and their souls, free from the cycle of reincarnations, are able to rest in happiness for eternity. In J R by William Gaddis, Karl Marx's famous dictum ("From each according to his abilities, to each according to his needs") is misattributed to Empedocles. ↑ House, Humphry (1956). Aristotles Poetics. p. 32. ↑ James Luchte, Early Greek Thought: Before the Dawn, Bloomsbury, 2011. ↑ Heath, John (2005-05-12). The Talking Greeks: Speech, Animals, and the Other in Homer, Aeschylus, and Plato. Cambridge University Press. p. 322. ISBN 9781139443913. An excellent study of Empedocles' vegetarianism and the various meanings of sacrifice in its cultural context is that of Rundin (1998). ↑ Plato (1961) [c. 360 B.C.]. Bluck, Richard Stanley Harold, ed. Meno. Cambridge University Press. ISBN 9780521172288. This suggests that e.g. Empedocles' vegetarianism was partly at least due to the idea that the spilling of blood brings pollution. Laërtius, Diogenes (1925). 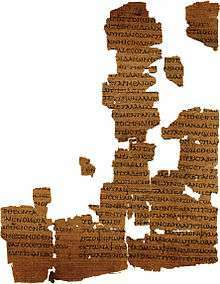 "Pythagoreans: Empedocles". Lives of the Eminent Philosophers. 2:8. Translated by Hicks, Robert Drew (Two volume ed.). Loeb Classical Library. Kirk, G. S.; Raven, J.E. ; Schofield, M. (1983). The Presocratic Philosophers: A Critical History (2nd ed.). Cambridge: Cambridge University Press. ISBN 0-521-25444-2. 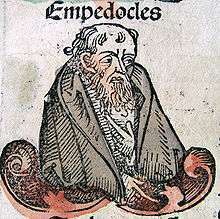 Wikimedia Commons has media related to Empedocles. Parry, Richard. "Empedocles". Stanford Encyclopedia of Philosophy. Campbell, Gordon. "Empedocles". Internet Encyclopedia of Philosophy.